We’ll move the earth, for you. Erickson Excavating of Cumberland, Inc. is a dedicated workforce focused on providing cost-effective, quality service. We deliver safely, efficiently and on time. In 1971, prior to graduating from University of Wisconsin Stout, Mark Erickson purchased his first backhoe. With his mind set on funding his college education, Mark worked during his summer breaks from college digging basements and completing small grading jobs. With a foundation of hard work, determination, a strong commitment to honesty and quality workmanship, it wasn’t long before Mark began making a name for himself in Northwest Wisconsin. At Erickson Excavating of Cumberland, Inc., our work can range from delivering a load of gravel for your driveway to completing an industrial site preparation. We work hard to give our customers a quality product at a fair price, no matter what size the job. With the support of his late wife, Nancy, and a strong foundation of ideals, Mark, his sons and his crew have expanded the business to uphold quality of service and meet local demand. From when we accept the job, to the moment our equipment leaves the job site, we are fully committed to the project and to you. Work with us and you’re working with experience. We take pride in our craft, and we strive for no less than perfection on every project. Safe and efficient, cost effective and on time. Our process guarantees your satisfaction on your project, from start to finish. We specialize in a variety of work across multiple sectors including: Residential, Commercial, Industrial, Agricultural, Road Building & Road Maintenance. We make it easy when sourcing materials for your project. We provide a wide variety of aggregate materials and topsoil from our privately owned and operated sand and gravel pits. We also offer recycled concrete and recycled asphalt in varying sizes. These materials can be delivered with our fleet of dump trucks or picked up at our pit locations. Erickson Excavating embraces new technologies & techniques in order to provide our customers with a safer,more efficient, and cost-effective construction project. Allows for possible conflicts/problems in proposed grade-plans to be discovered and addressed, before work begins – avoiding lost time and money associated with potential rework. Pre-building 3D models of job sites allow customers to visualize the finish grade contours of their project, before work begins. Our design-build capabilities allow customers the option to plan their existing project, and also plan for the future as well. Future building additions, parking, storm ponds, manure storage, feed pads – can all be planned in advance. Investing in and maximizing the power of technology is a cornerstone at Erickson Excavating. Our GPS machines equipped with automated machine control, allow our skilled and experienced operators to run a job site more efficiently and cost-effectively from the seat of their machine. Traditional grading with stakes scattered throughout a job is a thing of the past. Safer job site with reduced need of ground personal associated with stake setting. Improved finish grade accuracy and reduced cost by placing material one time and on-grade. GPS laser-augmented machines allow for extremely accurate and efficient grading in tight-tolerance situations . 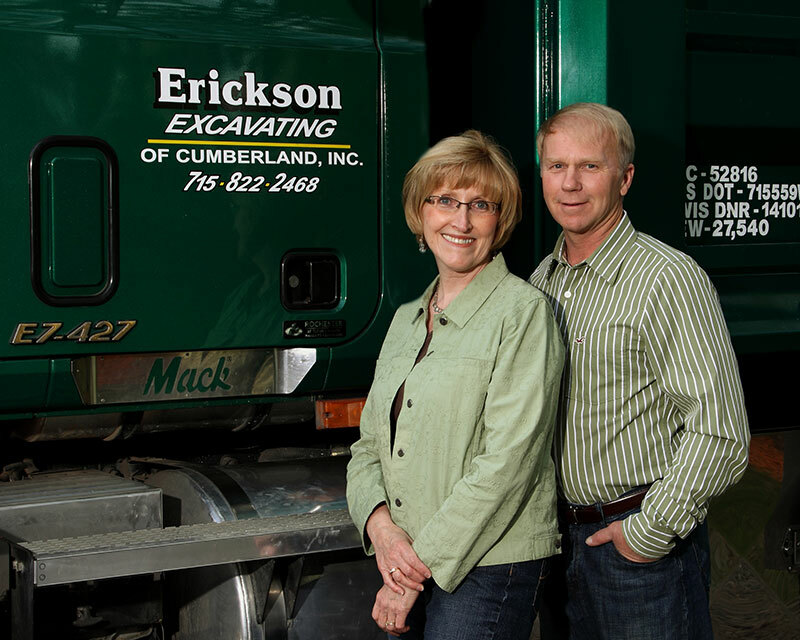 After being in business for 23 years and completing several industrial expansion projects requiring excavation, I rely solely on Erickson Excavating of Cumberland. Their knowledge and experience, along with the most up to date equipment, have proven, positive results. If you calculate tons of earth worked by the hour, they are simply the best. I greatly appreciate the strong virtues of a family-owned company. Thank you for everything you’ve done for the Schaffer family! Erickson Excavating provided experience, integrity, and dependability in establishing uncompromising quality in our finished product of Endeavor Stadium. The working relationship that the Cumberland School District established with Erickson’s professional staff was outstanding. Their genuine dedication to seeing our project become a reality while experiencing challenges and working countless hours was paramount in the on-time completion of Endeavor Stadium. I would recommend Erickson Excavating to anyone looking to turn a vision, like ours, into a reality. We simply cannot thank you enough! Erickson Excavating came when no one else would, did what no other company wanted to do and exceeded our expectations. They were friendly, easy to work with and above all- completed the work without flaw and in a timely manner. Would recommend them to anyone. Erickson’s are great people and have been great to work with on multiple projects we have done. They have always met or exceeded our expectations with their work and with meeting schedules. Their dedication to quality shows in their work. No matter the scale or complexity, we’d like to hear about your project! Fill out the form below, and a representative from Erickson Excavating will contact you shortly! 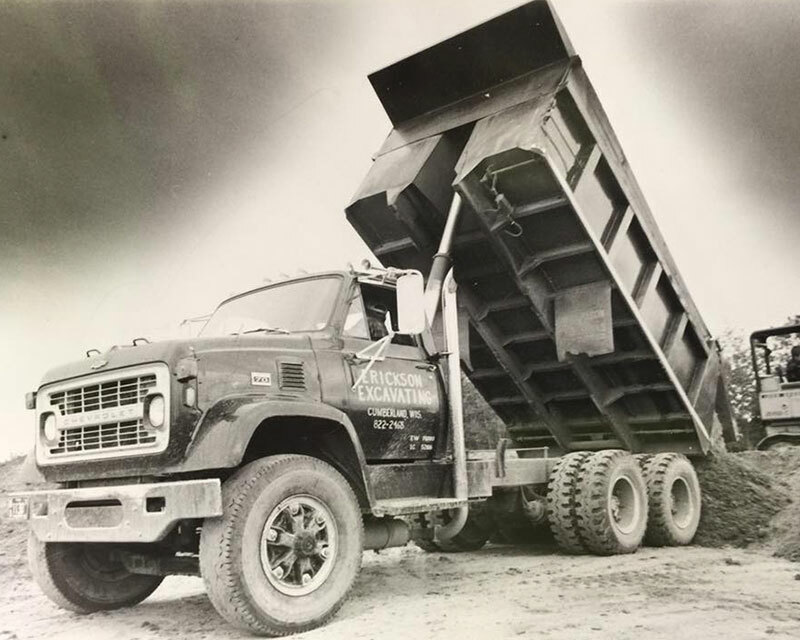 Since 1971, Erickson Excavating of Cumberland, Inc. has been serving northwest Wisconsin providing cost-effective, quality service – safely, efficiently and on time. © 2019 Erickson Excavating of Cumberland, Inc.